With a bumper harvest of asparagus to enjoy and excellent growing conditions across the county for seasonal produce, the bounty of the early summer is starting to appear at our local markets and farm shops. 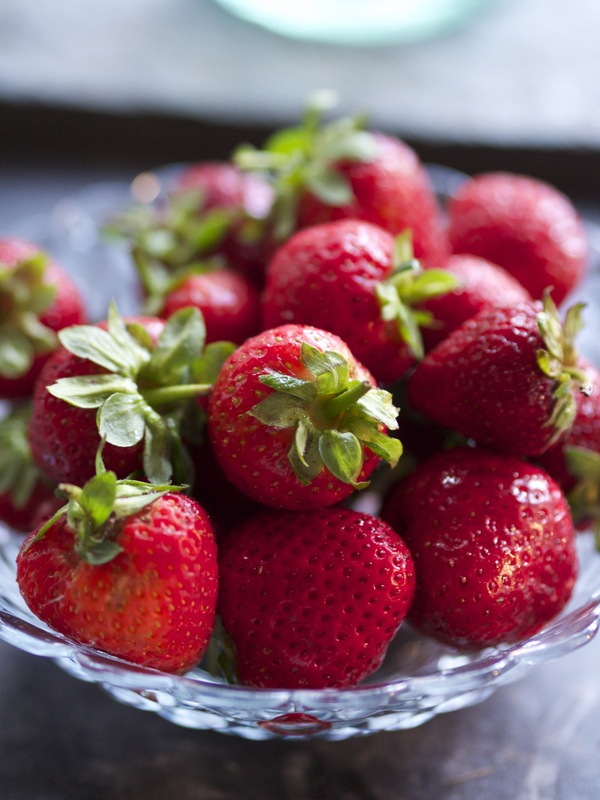 Growers and producers are at full stretch as we lead up to the summer solstice in the latter half of June, and the fruits of their labours should now be in glorious evidence. This June is Kent Farmers Market Month and many of the county’s will be holding special events – tastings, cookery demonstrations, local craft displays and much more – so that you can sample the very best that the Garden of England has to offer. As regulars know well, the county’s markets have far more to offer than just traditional fruit, vegetables and meat. Many sell everything from fresh fish and game to a wide range of ready prepared dishes and ingredients such as pasta sauces, handmade chocolates, vegetarian dishes and wonderful cakes and breads. And the benefits of buying locally at a market are enormous! Not only will you get the chance to taste before you buy so you know exactly what you are getting but as you are buying directly from the producer, you can talk to them about how the produce was grown or made. And most will be able to give you storing and cooking tips so you can really make the most of your purchase. Remember that because you are buying locally and seasonally pricing is likely to be competitive with the supermarkets and often cheaper so don’t fall for the idea that markets are an expensive luxury. For details of special events plus locations and opening times visit www.kentfarmersmarkets.org.uk or follow @KentFarmers on Twitter. The vagaries of the weather are nowhere more in evidence than with the asparagus crop at this time of year. This year cutting started in late April and, with an exceptionally good season in full flow, this great British vegetable is still with us. Eat your local asparagus traditionally steamed with melted butter or griddle the spears on the barbecue brushed with olive oil until tender then scattered with shavings of a sharp hard cheese such as Lord of the Hundreds, or maybe Kentish Bluebell or tart fresh goat’s cheese crumbled over. Try the spears in soups, vegetable gratins or make into a perfect risotto paired with the first tender broad beans (freshly picked little pods can be enjoyed whole) and fresh green peas. I like to stir in a herb butter at the end of cooking once the grains are tender (just whiz butter up in a blender – mint, parsley, basil and chives). Other veg to look out for are crisp radishes, spring onions, spinach, and of course new potatoes. There are also early cucumbers, runner beans, spinach and courgettes, alongside all kinds of salad leaves now in season. It’s also the ideal time to plant out ‘ready to plant’ herbs and summer bedding plants. If your visit to the market coincides with a sunny weekend, plan the perfect picnic. Fill your basket with locally made cheeses, pates, maybe a raised pie or Scotch egg. Then just add a loaf of artisan bread baked that day, some chutney or relish, a bag of cherries and maybe a punnet of strawberries and you are all set. A bottle or two of a local beer or chilled white wine and you have the makings of a feast…. Place the eggs in a pan of cold water and bring to the boil. Simmer for 6 minutes for a soft yolk then drain and cool under cold running water. Peel carefully. Trim the asparagus and toss in a tablespoon of the oil. Heat a ridged griddle pan until hot then add the asparagus and cook for 4 – 5 minutes turning regularly until tender and charred. Remove from the pan and leave to cool for 5 minutes then cut into short lengths. To serve divide the rocket between two serving plates. Scatter over the avocado with the radishes, pine nuts and the cheese. Arrange the asparagus on top with the shelled and quarter eggs. Whisk together the remaining oil, lemon juice and seasoning and drizzle over the salad before serving with sourdough bread to mop up the juices. 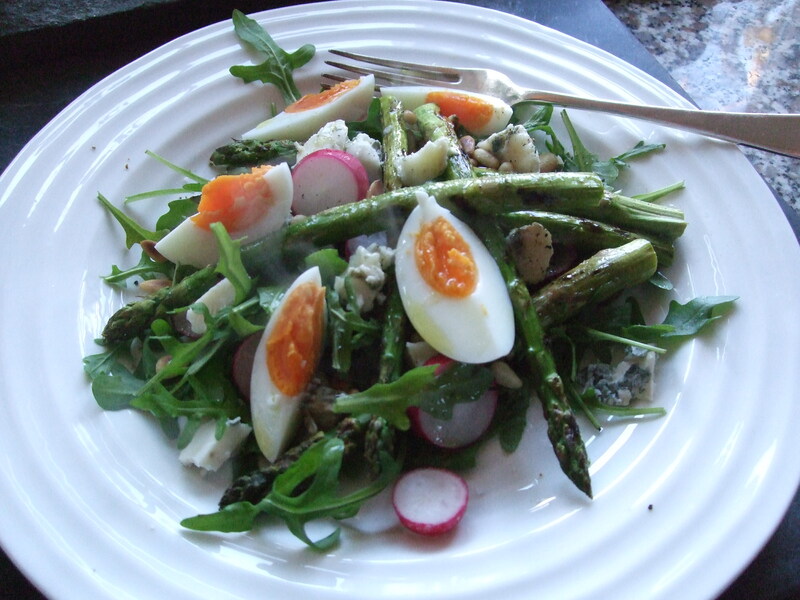 This entry was posted in Farmers Market, In season, Kent, Recipes and tagged asparagus recipe, farmers markets, June recipes, Kent farmers markets, Penshurst, Penshurst farmers market, Shipbourne. Bookmark the permalink.